Celebrate Bolivia's Independence Day with Pepe the pesky parrot's story. Pepe's unexpected journey starts with a bump on his head in the jungles of Bolivia and ends in the Andes Mountains where he finds a new home and family. It's there Pepe discovers it's better to be helpful than pesky. Then, Pepe even agrees to say a few words at a school program on August 6, Bolivia's birthday. 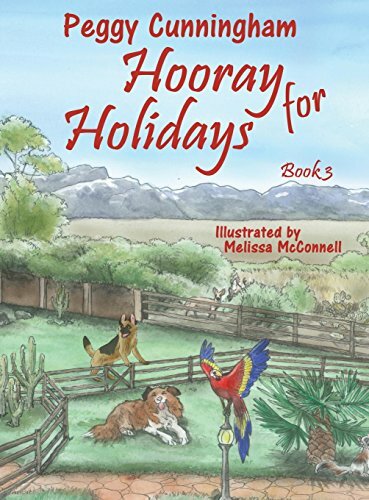 Next, enjoy a picnic on Labor Day with Wally the Watchdog, and his friend Heidi, the beautiful German Shepherd. Wally guards his house, and Heidi helps her dad fix cars--she carries tools to him. But on Labor Day, they are having fun and resting from their work. Wally asks Heidi, "Do you think there will be cars in heaven? Maybe I could drive in heaven. I can dream, can't I?" Finally, Columbus Day remembers a dangerous journey of an adventurous man called Christopher Columbus. He set sail from Spain to find Asia, but his journey ended by getting lost. Cali, the cat, got lost too when she set out and wandered far from her barn. But, both Christopher Columbus and Cali find something better than they could have imagined after getting lost. Columbus discovers the Americas. And, Cali finds Rumi Rancho. If you have any questions about this product by Pix-N-Pens Publishing, contact us by completing and submitting the form below. If you are looking for a specif part number, please include it with your message.